Along with my Ken Hubbs master set I'm also working on a master set of former Mets catcher Choo Choo Coleman. This card puts be at 3/4 complete of the master set. 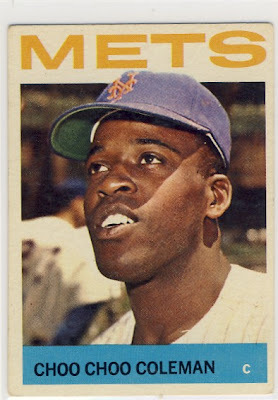 The card I'm missing in the series is a 1966 Topps #561 which in that set is considered a rarer high-numbered short-printed card. Consequently, I've only seen a handful ever make it on to eBay and the ones that are listed are outrageously priced...like this PSA 7 version for $85.